Got stress? It seems to be our constant companion in this life. In fact, stress is trying to be a companion of mine as I write my next book, Drama Free. 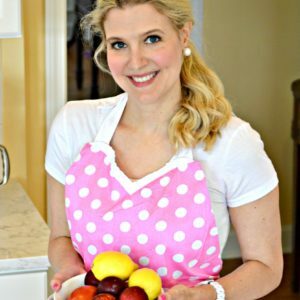 So, I asked my friend Sally Nance — who writes a wonderful blog called The Healthy Happy Woman — to share some practical ways that you and I can stress less. I’m already trying a few of these as I struggle with deadline pressure and they are really helping. Stress has become a 21st century epidemic, and women are especially vulnerable to its effects, particularly when it comes to our day-to-day outlook on life. 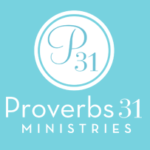 Whether it’s the big stressors, like a health crisis, divorce, or a major move, or the little stressors, like traffic jams and full schedules, there is always something threatening to steal our joy and leave us frazzled, exhausted, and discouraged. The good news is that it doesn’t have to be this way! We can experience joy and peace in the midst of a stressful world. I have discovered 5 proactive ways to deal with stress, protect your joy, and live a happy life. Pray – Talking and listening to our Creator is one of the best ways we can begin our day. Charles Spurgeon said, “There should be no one with whom we converse so much as with Jesus.” Bringing all our current and potential difficulties to the One who rules the universe and who has numbered the very hairs of our head will calm our hearts and prepare us for whatever stressors the day may bring. Philippians 4:6-7 says, “Do not be anxious about anything, but in everything by prayer and supplication with thanksgiving let your requests be made known to God. And the peace of God, which surpasses all understanding, will guard your hearts and your minds in Christ Jesus.” God promises His peace when we bring everything to Him in prayer. Ponder God’s Word – Meditating on the truth of God’s Word is essential to dealing with stress and protecting our joy. Reading, studying, and memorizing Scripture will transform our thinking and crowd out negative and worrisome thoughts. We cannot think biblical thoughts and stressful thoughts at the same time. Rather than fretting and stewing over our problems, why not fill our minds with God’s promises and the ultimate victory we have in Him? Romans 12:2 says, “Do not conform any longer to the pattern of this world, but be transformed by the renewing of your mind.” God’s Word transforms our thoughts, which transforms our attitudes, which transforms our lives! Practice Gratitude – Studies show that grateful people are happier, less-stressed people who live longer lives. They make a practice of giving thanks. 1 Thessalonians 5:18 says, “Give thanks in everything.” This doesn’t come naturally. We have to practice it. Start by writing down 3 things you’re thankful for each day. Include big things and little things. The more you do this, the more you will begin to notice how much there is to be grateful for in any given day. Pump Some Iron – Whether it’s lifting some weights or going for a walk or jog, it’s important to get moving, because exercise is a natural mood-booster. When you’re feeling stressed, exercise is often the last thing you want to do. But once you get moving and get your workout in for the day, you will feel much happier and less stressed. And I guarantee you’ll start looking forward to your daily workouts, because they help keep your body strong and better able to cope with daily stress. Prioritize – We can experience a lot of stress and joylessness, because our priorities are out of whack. Perhaps you don’t even know what your priorities should be. I strongly encourage you to take some time to pray about what is important in your life. Write out every priority you have during this season. It could be an outside job, your husband, kids, ministry opportunities, etc. Just keep a list of 5 to 6 of your most important priorities. Under each one, list several goals you want to accomplish. Perhaps it’s taking a vacation with your husband, turning your hobby into a business, or scheduling regular get-togethers with friends. Begin writing each of these goals into your weekly schedule. When you learn to say “no” to the good things in order to say “yes” to the best things, you will experience the joy of living a life of purpose, which will protect your joy even on the stressful days. 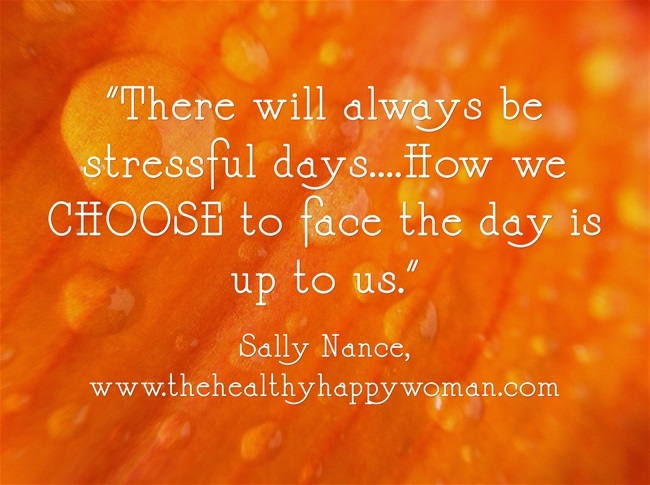 To get access to these printables (as well as a library of other great printables) from Sally Nance, subscribe to the Healthy Happy Woman blog at http://thehealthyhappywoman.com/subscribe/. Which of Sally’s tips do you think will be most helpful to you? I’d love to hear it (on my book-writing breaks!) in the comment section below. on 5 Ways to Less Stress. The privilege was mine, Sally. Thank you for sharing your words of wisdom to help us all with an area that we continually struggle with. Cindi they are all great tips, but the two that I feel I need to work on more are practice gratitude and prioritize. I need to work on writing my gratitude list and I like her idea of writing out five or six priorities and listing several goals I want to accomplish within each. Lydia, I need to work on those two, as well. It’s amazing how much our perspective changes and how much peace floods us when we become thankful for all we have. Thanks for reading and commenting. I know Sally appreciates it, too. Thanks for sharing, Lydia! Yes, I have found practicing gratitude and prioritizing extremely helpful for reducing stress and giving me an eternal perspective on life. So glad you found those helpful! ? How can one get a copy of her weekly goal sheet? Hi Lydia! Yes I have goal planning sheets, calendars, meal planners and more in my printables library which is free for subscribers. Here is the link: http://thehealthyhappywoman.com/subscribe/. It will be part of the 5-page planner once you’re in the library! My biggest problem is getting out of my own head. I seem to be there too often- rehashing the stressors, and losing my joy.